On 14 May 2014 I found an odd looking warbler in the reeds at the percolation pond at Dhahran Hills. This is a good location for seeing Indian (Clamorous) Reed Warblers but this bird looked a little different and gave me the impression it may be a Basra Reed Warbler. The bird was not a classic Basra Reed Warbler so I tried to photograph it and managed to get a single photograph before it moved on. Despite searching the area over the next few weeks I never saw the bird again. I sent the photo to Mike Pope in Kuwait as they see the birds occasionally there and he replied “Not easy this one, but I think the choice is between Basra and Indian Reed – Indian Reed is resident and Basra also present in summer months. Primary projection may be too long for Basra, but is not short enough for Indian Reed. Indian Reed also has slender bill like Basra (it is difficult to make out the base colour of the bill), but has a shorter super that doesn’t go past the eye…It is probably closer to Basra than Indian.” These were my thoughts as I thought the bill looked too long and thin for Indian Reed Warbler but it may be a trick of the angle of photo. The tail looked quite long but I am not sure how this appears in the field. In the hand the tail is much shorter on Basra Reed Warbler than in Indian Reed Warbler. 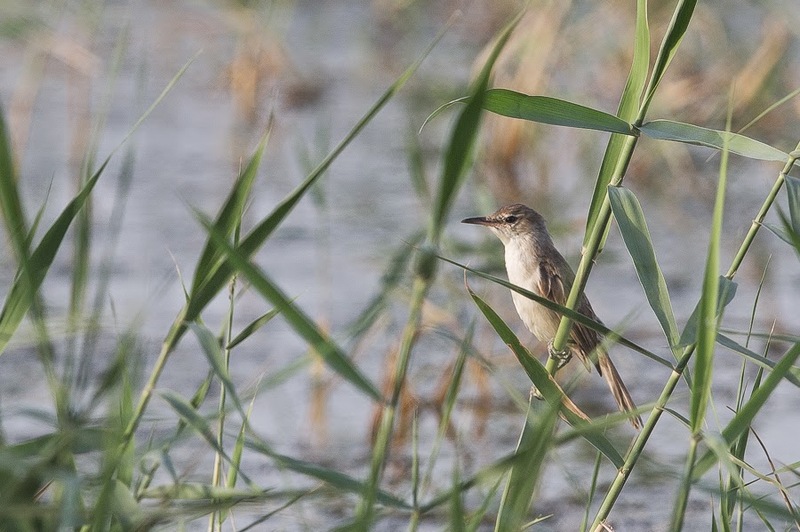 The problem was that Indian Reed Warbler is very common in the Eastern Province of Saudi Arabia whereas Basra Reed Warbler is a scarce passage migrant. May is, however, the best month for locating them. Other comments received mentioned “Body structure being heavy more towards European Reed Warbler or Indian Reed Warbler. But judging the length of tail compared to primaries, I think it is an Indian Reed Warbler the bill fits this species rather than Great Reed Warbler”. Peter Kennerley mentioned, “The relatively slim bill and what appears to be a proportionately long primary projection suggest Basra Reed. I would not expect brunnescens Clamorous (Indian Reed Warbler) to share this structure. The overall cold tone to the plumage also favours Basra over brunnescens, but I recognise that plumages will fade and bleach so this could be misleading. If pushed I would go for Basra Reed”. All in all this was a very interesting bird that I am leaving as unidentified. Like me most people think it may be a Basra Reed Warbler but unless I relocate the bird I will not be able to say for sure.